"Double double, toil and trouble…” This is the line most associate with the caricature of witches, a line taken from William Shakespeare’s depiction off three witches hard at work brewing a charm in Macbeth. Ironically, this line is a miss-quote, a near-miss; one example of how one could so confidently present the Witches myths, and it yet be so completely different from another’s understanding. The actual line is “Double, double, toil and trouble…” although it does come from Macbeth. In the scene that has this line three witches are brewing a charm at a large cauldron, bubbling over a fire. Into this pot they are throwing all manner of ingredients not likely to be found to hand in a typical pantry. Toad entrails (poisoned, of course), snake fillet, owl wing, wolf tooth, scale of dragon, and the infamous “eye of newt” all make the list, along with other, even more unsavory items. Three crooked, black-garbed crones filled with malicious intent and bitter, unholy knowledge breaking the laws of nature with evil in mind—this is the typical presentation of witches. Like many myths and legends, part of the reason most people think of witches as some other kind of creature than human, as black-hat wearing broomstick flyers accompanied by black cats, is because that is how they were presented, in stories much like Macbeth. The history behind the myth, however, is much more full, varied, and dependant on geography. There is no way to pin down the exact genesis of the Witches Myth, although Genesis is when it may have come about. Ascribing supernatural powers to things mankind did not (and at the time, could not) comprehend was a common way of dealing with the unknown in ancient history, and witches and other types of magicians and wizards were present in the lore of all peoples. The actual history of witchcraft (as opposed to magic- use in general) is tied closely to paganism, and has its roots in religion. 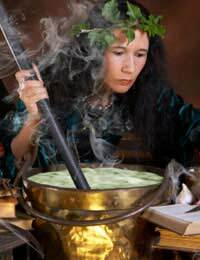 Today people who practice witchcraft as a religion are often referred to as Wiccians, and it is their belief that they are practicing something beneficial and benign. This belief is not always shared, and in the past the differences in belief often lead to witch hunts. The witch hunt is often tied to the infamous Salem Witch Trials of early American history, where a feverish rash of accusations lead to the death by trial of many citizens of Salem. Accusing a magic practitioner of dealing with evil forces, leading to their trial and execution, is not a practice unique to the Christian church, however, and has been a facet of history for as long as there have been people claiming magical powers. The typical characteristics and abilities of the stereotypical witch- a black cat familiar, the ability to fly on broomsticks, shape changing and spell casting- remain attached to the Witches Myth. Regardless of the historical truths of witches and witchcraft, when it comes time to dress in costume, the long, warty nose and pointy black hat will come on quickly.